This easy dairy free potato soup recipe is the perfect comfort food, especially on those cold winter days. Grab a bowl and warm up with this easy dairy free meal for everyone. It’s also a completely vegan potato soup recipe and gluten free as well. On those cold winter days, we dream of warming up. Whether you are outside playing with kids in the snow or just hoping into your car after a long day at work, you just want something to comfort you, warm you up and make you feel cozy. This dairy free potato soup does all those things. 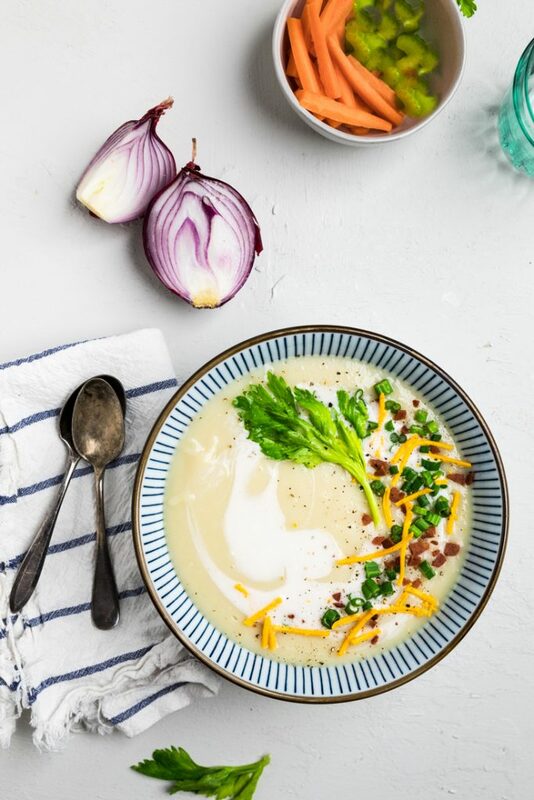 Best of all, we’re showing you how to make a loaded dairy free potato soup as well. Thankfully, dairy free potato soup isn’t one of those hard to make soups or a comfort meal that takes a long time. This soup is made in under 45 minutes and most of that time is just waiting for it to all be finished cooking. Easy peasy for you. It satisfies all the comfort cravings you’ve been wanting! 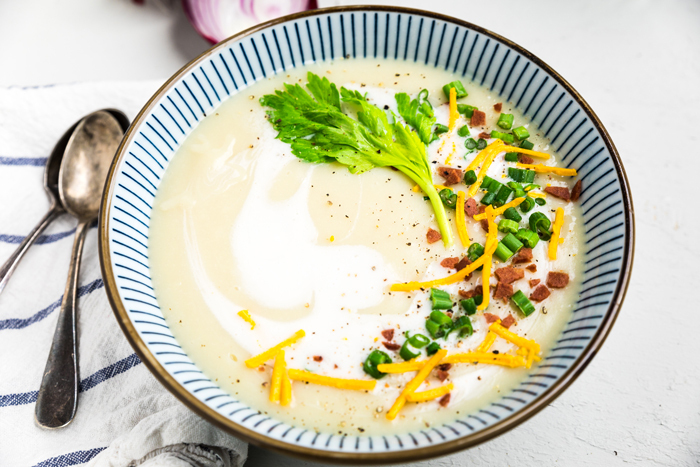 What ingredients do you need to make this dairy free potato soup recipe? 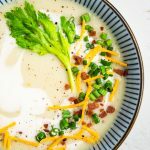 Maybe or maybe not surprising, but it actually does not take a lot of ingredients to make this dairy free potato soup recipe. In fact, you only need 8 plus salt and pepper. Those 8 ingredients also make this a completely vegan potato soup recipe and it’s also naturally a gluten free potato soup recipe. That’s it. That’s all you need for this easy dairy free potato soup recipe. 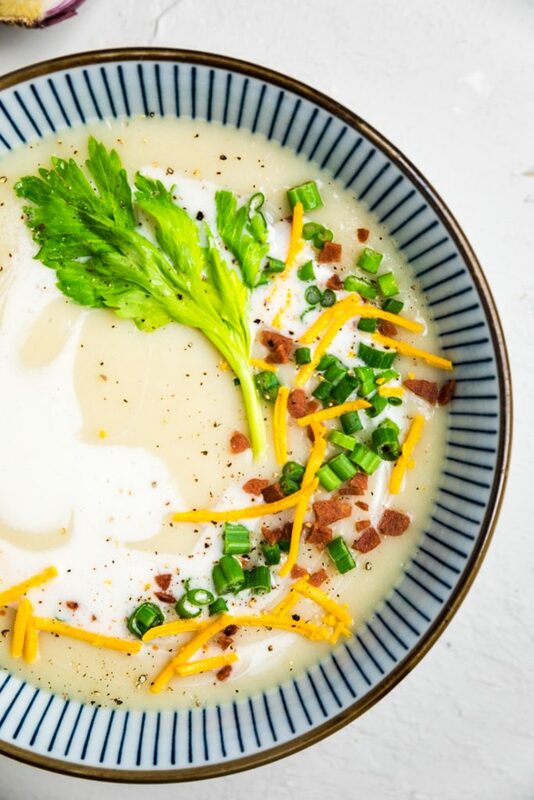 If you are wanting to make it a loaded dairy free potato soup recipe, then you will also need vegan bacon, dairy free shredded cheddar cheese, green onions, and vegan sour cream or plain yogurt. This would also make it a vegan potato soup recipe. 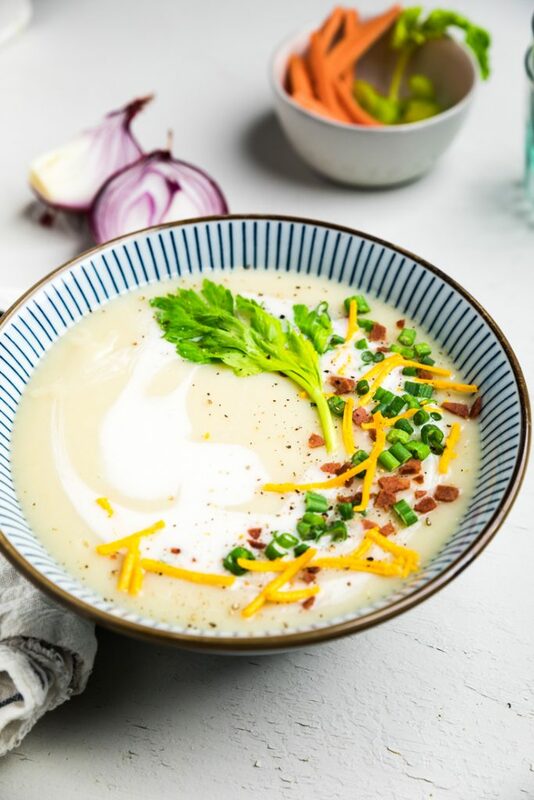 How do you make this dairy free potato soup recipe? In order to make dairy free potato soup, you just need a few simple steps. First, start by cutting up all your vegetables. Once you have them all cut up, then you will start by sautéing all the vegetables, except the potatoes, in the olive oil in a large dutch oven. If you do not cook with oil, then you can use a few tablespoons more of the vegetable stock and cook them in there. Once you have sautéed your vegetables (approximately 4 minutes), drop the temp to low, and add in the potatoes, almond milk, and vegetable stock. Stir together and add salt and pepper to taste. *If you are making the loaded dairy free potato soup, you can start by cooking vegan bacon inside of the dutch oven before sautéing the vegetables. *If you are not vegan, you can make this with regular bacon the same way described above. If you are doing that, then sauté the vegetables in the bacon grease and omit the olive oil. Cook the dairy free potato soup on low for 10 minutes. After 10 minutes, use a potato masher to slightly mash the potatoes. Cook for another 10-15 minutes and then remove from heat. Continuing mashing with a masher. If you prefer a smooth, non-lumpy dairy free potato soup, you can put the soup into a high powered blender, like a Vitamix, and blend well. Top with any additional toppings and serve. 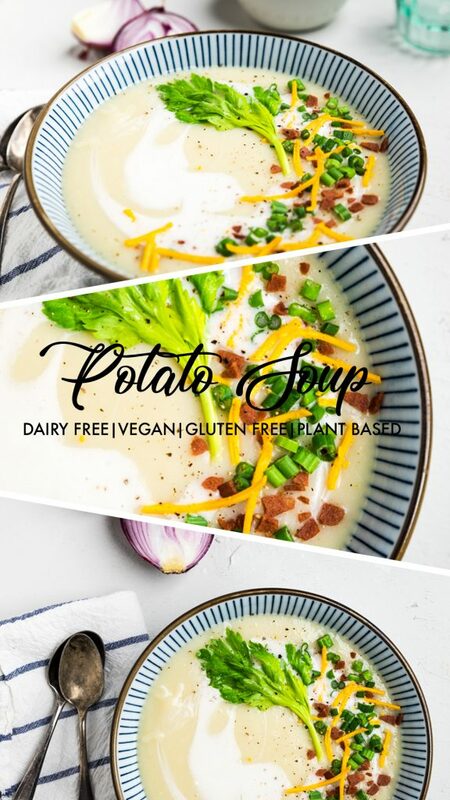 That’s just how simple it is to make this easy dairy free potato soup. What sides pair well with this dairy free potato soup? 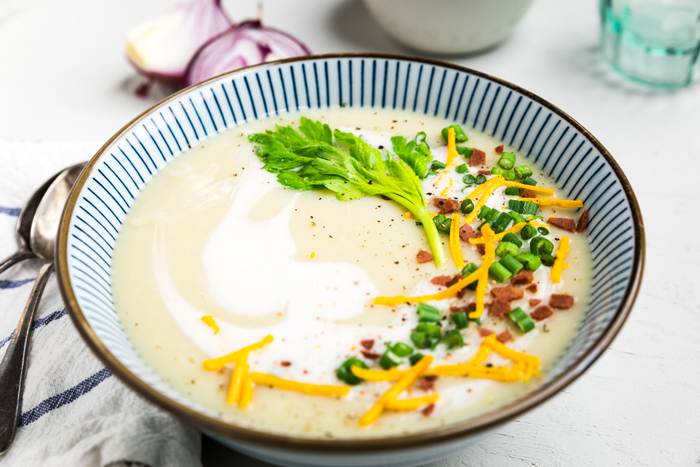 You may be looking for some delicious sides that go along with this dairy free potato soup. You could easily make a grilled cheese with dairy free cheese slices or pair with another variation of your favorite sandwiches. Why did my dairy free potato soup turn out brown? Potato are finicky little creatures when cooking. If you cut them along with the other vegetables, throw them in a bowl of water until you are ready to throw them in the pot. Then drain and put them in. It’s also really important when making this dairy free potato soup that once you add the potatoes you turn the heat down to low. The enzymes in potatoes react to air and cooking temperature, so it’s important to do these things. If your soup did turn a darker color than what you see in the photos, it will not affect the taste of your dairy free potato soup. So still enjoy it! *If making loaded baked dairy free potato soup, in a large dutch oven (we use an 8 qt), cook vegan bacon according to instructions. Remove to drain and then crumble. Proceed with directions as follows. In the same pot, over medium heat, add in the celery, onion, carrot, and garlic. Cook for 4 minutes or until onion is translucent. Turn heat down to low. Pour in potatoes, milk and vegetable broth slowly. Stir together and then add salt and pepper to taste. Cook for 10 minutes. Using a masher, mash down the potatoes until desired consistency. *You could also use an immersion blender or high powdered blender like Vitamix if you would like a very smooth soup, but we like small chunks of potatoes in ours. Continue to cook for 10-15 minutes or until potatoes are tender, stirring often so the potatoes don’t burn on the bottom. If doing a loaded potato soup, add in all the bacon and cheese and stir together until melted. Remove from heat. If your soup is too thick , add up to an additional 1 cup of milk, 1 tbsp at a time until desired consistency is reached. Adjust salt and pepper if needed.